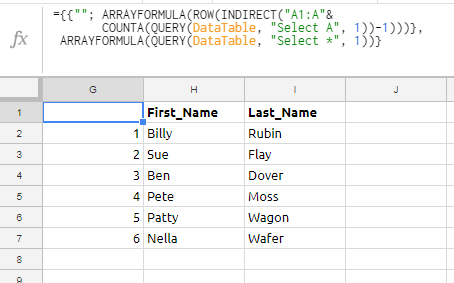 Is it possible to add a column of numbers to the results of a query? It would be nice to have a number (from 1 to n) next to each record returned from a query. You'll recognize your original QUERY second in a list here. The QUERY before that is running the number column. The "A1:A" in the INDIRECT function is arbitrary. We're just creating an array of "row numbers" that start in row 1, to get the count from 1 to n.
Not the answer you're looking for? Browse other questions tagged google-sheets formulas google-sheets-query google-sheets-arrayformula or ask your own question.